Hi all! Me Fit and Fashion Mom and fellow blogger Mommy Tess of Smart Mommy Online have come up with this idea to held a contest for you guys and this is my first time to collaborate with other bloggers too, so I hoped you all support us and join our contest. 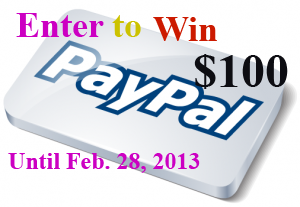 Two (2) lucky winners will receive $50 Paypal cash each. We guarantee you all that joining is so easy, just fill up the linky tool below to enter. This contest is not possible without the help of our fellow bloggers, who contributed for the prize money, so be sure to visit their site for some interesting posts you will enjoy to read. Go to the giveaway tool and type in your name and email add. I'm joining! I want to win so I have something to spend on my birthday! This is cool! Good luck everybody! I want to join! Hope I win hehe. Good luck to those who entered.. I'm going to join, hoping to win cash again this time! This is a nice way to earn a few extra bucks! I will definitely join your giveaway. This will be a great help if I'll win. I need some cash for hubs birthday. Thanks you!